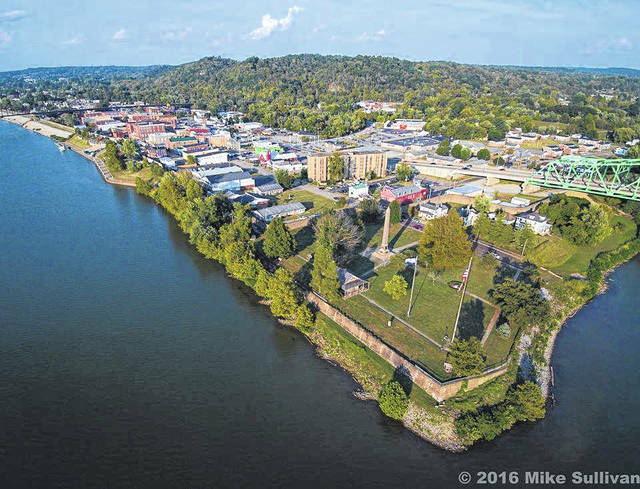 This aerial photo of Point Pleasant taken by Mike Sullivan and shared by the Mason County Convention and Visitor’s Bureau, shows “the point” in Point Pleasant, at the place where the Kanawha meets the Ohio River. POINT PLEASANT — It’s an honor just to be nominated but the objective, at least for the City of Point Pleasant, is to win the national title of Best Small Town Cultural Scene. The city is a contender in the 2019 10Best Readers’ Choice travel awards, which is part of a contest recently launched and promoted by USA Today. Voters have four weeks to select 10 winners via a website with those “10Best” winners announced on May 17, then later on USA Today. Voting can happen once daily through the run of the contest which ends on Monday, May 6. Point Pleasant was chosen as a finalist by a panel of experts including food and travel writers who have traveled the globe. The experts listed for the contest include, Marla Cimini, an award-winning writer with articles that have appeared in numerous publications worldwide, including USA Today and many others. She is co-author of the book, “A Century of Hospitality,” a historical exploration of US hotels. Deborah Fallows, a writer and linguist, who wrote a national best-selling book with her husband James, “Our Towns: A 100,000-Mile Journey into the Heart of America.” Eric Grossman, a travel and food writer who has visited more than 50 countries. Anna Hider, a writer and social media manager for Roadtripers, a trip-planning site and app. Gerrish Lopez, a food and travel writer/photographer who has traveled from the tiny island of Lanai to large cities like Hong Kong and Mexico City. Point Pleasant is competing against 19 other destinations, including: Doylestown, Pa.; Media, Pa.; Manayunk, Pa.; Traverse City, Mich.; Guthrie, Okla.; Easton, Md. ; Paducah, Ky.; York, S.C.; Breaux Bridge, La. ; Sequim, Wash.; Taos, N.M.; Highlands, N.C.; Tucumcari, N.M.; Tarpon Springs, Fla.; Staunton, Va.; Lenox, Mass. ; Asbury Park, N.J.; Marfa, Texas; Solana Beach, Calif.
As of Friday afternoon, Point Pleasant was in second place out of the 20 total contenders, just behind Doylestown.